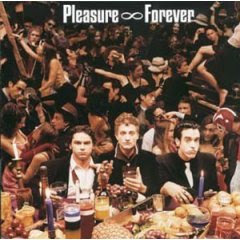 "Pleasure Forever the musical embodiment of that orgone enigma of human will and desire. Compromised of the deceptively simple instrumentation of piano, guitar and drums, Pleasure Forever fuses the utopian ecstasy of `60s psychedelic pop with the sinister undercurrents of `70s hedonist claustrophobia. The resulting album is a surreal vision of humanity, both ancient and contemporary, that embraces collapse as much as it yearns toward infinity." I'd say that sums them up quite well. 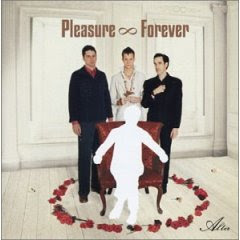 Pleasure Forever formed after the demise of the legendary art-punk band, The VSS. Initially they called themselves Slaves, but people got the wrong idea so the band decided a name change was in order. They combine the best aspects of psychedelic rock with cabaret inspired piano, resulting in dark, sleazy, and flat out cool songs that wouldn't sound out of place at a brothel in hell. I highly recommend this band. I'm still kicking myself for not getting a chance to check them out live before they broke up. link to alter seems broken...any chance to have it fixed? it would really be awesome.